In a modern twist on an old practice, the HIM departments at two facilities get hands-on with physicians to improve workflow. Physicians at the University of Mississippi Medical Center (UMC) were clearly frustrated. Limited assistance from the IT help desk was of little use as the physicians attempted to navigate their way through the EMR and sticky coding issues. Consequently, in 2012, UMC Chief Health Information Officer John Showalter, MD, MSIS, decided to take matters into his own hands, reaching out to Innovative Revenue Cycle Leader Leigh Williams to devise a plan in which HIM would replace the help desk as the main support for UMC's physicians. For Showalter, the partnership was a natural fit, stemming from his medical and clinical informatics training. "I always felt those fields were tied at the hip," he explains. "So when Leigh and I decided to collaborate to help address physicians' deficiencies in the EMR, we were speaking the same language." As Williams points out, the EMR is at the center of the physicians' workday, having evolved into something far beyond the paper charts of the past. "Doctors put their lab reports into the EMR; they also order prescriptions. EMRs are way beyond charts," she says. "Helping physicians to not only navigate the EMR but to also ensure that their records are complete and accurate requires efficient and effective collaboration between the medical and HIM staffs." To help get the project up and running, Showalter and Williams recommended the two groups share screens, a process that would allow the HIM team to help physicians sign charts more efficiently. Now, physicians simply call a specific number to access screen sharing in real time. "What we found was that this system not only reduced deficiencies but it also proved to be a sneaky form of physician education," Showalter says. "The doctors don't realize that while they are solving problems in their workflow in real time, they are also becoming more educated, which reduces questions and other issues in the future." "If you're a doctor, you've gone through years of practical education where you were taught to be hands-on," Williams adds. "Therefore, physicians are people who are very tangible learners. When you do EMR support in their workflow and screen share in real time, you are right there with them, showing them what you mean." UMC's HIM staff interacts with physicians in such a manner that it improves efficiency and enhances workflow. The HIM team meets with the chief medical officer, department chairs, and other organizational leaders to identify the best ways to work with each specialty. "For instance, our department of surgery prefers elbow-to-elbow rounding and divisional-based education, and that's how we work with them," Williams says. Ultimately, physicians care about outcomes. "If you can break it down for them and help them understand why this is important, then they are on board. If we explain readmissions data, for instance, then they understand and document an issue correctly," Williams says. "Human beings are complex, and what CMS [the Centers for Medicare & Medicaid Services] is pushing us toward is looking at the whole individual. We need physicians to look at whole people. Consequently, we're helping physicians understand how reimbursement works these days. Pay-per-service is going away, and pay-for-performance and other models are replacing it. Doctors need to understand how to do the small things that meet the needs of this new model. We tell them only what matters to their specialty and practice. Then, we go very much with the technology around what will make it efficient, effective, and in line with their workflows." Williams says the formula for gaining physician satisfaction is straightforward. "If you make people go where they don't want to go, then they won't be happy. But if you help them get where they want to go, and give them the directions to get there the next time, then they're enthusiastic in supporting your efforts," she notes. It's not just the UMC medical staff that has bought into the program; HIM has found it to be a rewarding experience as well, which is good news for the profession's future as it struggles to find its identity in a rapidly changing health care landscape. "There are a lot of HIM people who haven't known how to integrate into a health care system," Williams says. "But our HIM team has been really receptive to this new model. They've taken it on 24/7. They get about one call a month after hours, yet they have voluntarily assumed this round-the-clock coverage. They feel like it's elevated their roles. Now, they feel like a group that's really partnering with physicians, and they've been very pleased with the change in their profession at UMC." The success of the UMC model is underscored by hard data. According to Showalter and Williams, since the new real-time screen-sharing system launched, the facility has realized 70% reductions in both deficiencies and dollars on hold due to incomplete documentation. The result has been a $3 million increase in cash flow. UMC is not the only organization to insert its HIM staff into a collaborative partnership with physicians. Under the guidance of Corporate Director HIM/Privacy Officer Marcia Matthias, Southern Illinois Healthcare has also taken the plunge. "HIM can truly be a partner with our physicians. Last year, we began a dialogue with our IT department to identify improvement opportunities in supporting our providers with their usability of our EMR," Matthias says. "To fill the role of training and answering other physician questions, Southern Illinois Healthcare then decided to use members of the document specialist staff, who are present at the facility all the time. Currently, they wear many hats, and two of their new roles are to assist the providers in troubleshooting issues and to answer questions involving record completion in the EMR." The genesis of the Southern Illinois program was similar to that of UMC. "We saw an opportunity to improve provider customer service," Matthias says. "The IT provider team that was solely responsible for support wasn't at the hospital all the time to give the providers elbow-to-elbow support. The IT clinical director and I had a discussion, and she was looking for a way to get these skilled staff out of the provider help desk role and more focused on enhancements, maintenance, and builds of provider documentation. We identified that, when the IT staff were more hands-on with the training, the 'why' behind the request to e-sign an electronically generated document or complete a field in the template couldn't be explained. This is not a fault of IT; it's just not their forte to know the rules and policies for documentation needs." For example, when a Southern Illinois physician created a document in the EMR for the wrong patient and reported the error, a member of the IT staff erased the document, not understanding that medical records can't be deleted and certain processes must be followed. Clearly, a documentation specialist would have known the proper protocol, Matthias says, adding that these professionals also are better equipped to handle other issues such as queries. Like at UMC, the documentation specialists at Southern Illinois Healthcare can screen share with physicians and direct them as they maneuver through the system. Screen sharing also works well when the provider may be off-campus and having difficulty completing his or her charts. "The other beauty of the new design is that the documentation specialists are in the hospital and can easily assist the provider one-on-one if needed," Matthias says. "If the doctors' questions require more technical assistance, then the physicians are directed to the IT help desk." Matthias notes that this new collaboration extends the relationship between physicians and HIM professionals. "The physicians have been used to coming to the HIM department for help for many years. They know us. That's what they were used to doing," she says. "They appreciate having someone right there to answer their questions." Others in the HIM field remain skeptical of the models employed at UMC and Southern Illinois, saying such systems are likely to be inefficient at most facilities. "I can't imagine any physician wanting to take time out of the day to screen share," says a senior vice president. "I don't see this as a standard in the industry. We have a policy where queries time-out because physicians won't answer them. All they have to do is answer the query, and that will increase cash flow. No screen sharing is required. We used to carry the records to the physicians' lounge and have them answer the questions. This feels very much like those old days." A director at the same facility adds, "As you look out into the industry, the industry is headed to where everything's existing in the palm of the physician's hand with a mobile device. So, in that emerging scenario, this new model simply won't work." Williams respectfully disagrees. "It's not old school; it's reenvisioning. What is innovation? It's taking people and processes and using them in new ways to solve problems," she explains. "All we're doing is taking old ways of doing things and employing them in modern ways—real time, where the physicians are, meeting their needs in the best ways for them." Williams says that screen sharing takes less than a minute to arrange. "This is beneficial because everyone has his or her own version of the software," she says. "Prior to this model, there was a real gap because everyone was guessing at what the other party was looking at. For instance, coders don't have the same information on their screens as physicians. By sharing screens, HIM staff and physicians can see what's on one another's screens, and HIM can answer physicians' questions quickly and easily." Williams adds that coders aren't sitting around with nothing to do. However, physicians can't simply close their charts or just choose a diagnosis, both of which create issues. "Either something is late or the claim doesn't have the patients' true information," Williams says. "You don't want that erosion of quality. Physicians want and need the coders to help them be successful." For Pamela C. Hess, MA, RHIA, CCS, CDIP, CPC, an AHIMA-approved ICD-10 trainer and regional coding director at himagine solutions, the setup is somewhat akin to operations in the old days. "I've seen similar models working with the phone, obviously. The typical way to do a query nowadays is through an in-basket or e-mail. But in the past, there wasn't so much back and forth by phone. It was the same when HIM people were up on the unit talking with physicians," she says. Andrea Romero, RHIA, a regional coding director at himagine solutions, agrees. "Screen sharing helps coders who are working remotely to be able to have conversations with the physicians that include reviewing specific documentation and discussing the coding implications," she explains. "Products on the market that are completely electronic lose the personal touch and interaction that can aid clinical documentation improvement education." "Physicians are much happier with their new level of support," Williams adds. "Some things in HIM need to come full circle. When we moved to the EMR, people sometimes stopped doing core things. People forget that the EMR is still the legal medical record, the document that houses the legal medical data. You have to remember what's important in the HIM rules and apply them in a completely different environment. A successful partnership like this begins with mutual respect and understanding toward one another and the current requirements." With ICD-10 set to go live in October, UMC has implemented a diagnosis calculator into its system. "Essentially, we can help physicians understand what code goes into the system based on ICD-10," Williams explains. "We're not leading them. We're asking, 'A or B?' It breaks down the vocabulary terms into sections and provides modifiers. In order to select a code, physicians travel down a decision tree for their ICD-10 billing." For example, take the case of a pediatric patient who presents with a fever, yet the physician isn't sure of its cause. "You have to choose a code in ICD-10, and the physician doesn't know what to pick. She knows that she can't complete her workflow until she checks one of the possibilities, but she doesn't know what to check. In this scenario, the coder would give the doctor the option in real time. She can pick up the phone and get a coder on the line and ask whether it's A or B. The doctor can get help no matter where she is," Williams says. Romero believes this kind of communication is vital to a successful ICD-10 transition. "That one-on-one education with real examples that are in front of physicians will show them the level of coding that's needed for ICD-10," she says. Showalter says UMC initially turned to HIM because the calls to the help desk were less about computer issues and more about needing to educate physicians in the EMR. He believes it's possible for transcriptionists to also follow this model. 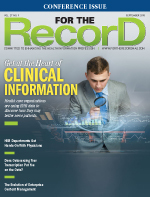 Physicians often need guidance on where and how to document in the EMR. Because transcriptionists are comfortable using computers and familiar with physician documentation, they would be well equipped to help on that front. However, they would need to be trained to better understand physician workflow concepts, Showalter says. "Doctors are struggling with so much inefficiency with the EMR," Williams says. "Doctors will appreciate anyone who sits down and says, 'I'm going to help these physicians with what they need to do, priorities and efficiency first.'" She continues, "We live in an era in which we are shifting reimbursement models. By fiscal year 2018, 80% of reimbursement will be based on outcomes. That is based on clinician reporting. If we don't help doctors understand the new rules of the game, organizations could be largely impacted in a negative way. If we don't help our clinicians understand priorities and how this system works, then there will be greater issues." Williams says organizations must be realistic in their expectations of how a physician-HIM collaboration will work, noting it's unrealistic to believe that 100% of physicians will be on board. "But you're not going to get 100% of any group in any organization," she says. "I recommend that facilities look for where they think it might work and also focus on areas where there are a lot of questions or changes on the horizon, where they can get a foothold and prove it out. Physicians who see your support as a benefit then become your champions." — Susan Chapman is a Los Angeles-based freelance writer.